It is recognised that the relocation of servers and server room equipment requires special attention during a major move and therefore a dedicated specialist team to support this part of the relocation should be provided. A variety of services are available designed to make the move go as smoothly as possible and, should the client require it, enhance the final product at the new location. Generally, to minimise downtime, and therefore service impact, servers will be the last to be powered off and the first to be powered on. However, because this has the effect of limiting the time frame available for the relocation, server removals specialists will, in liaison with the client's representative, create and be bound by a strict schedule for each move phase. Server removal is critical to the success of the transition project, therefore to ensure the overall success of the server relocation our local companies will provide a dedicated server-team whose only task is to ensure that the agreed schedule timescales and quality standards are met. Depending upon the complexity of the relocation and the servers involved we can provide either Accredited Engineers or Server-aware engineers as appropriate for the product. In some cases the server type may fall outside of our standard offerings. In this situation we can involve the server manufacturer / supplier in the relocation activity and manage their involvement for the client. A hardware audit must take place and a schedule produced either by the server relocation manager or by the client. The details should include the current location, the new location, serial numbers/asset numbers etc. The service impact analysis should be carried out to establish dependencies, taking into account existing Service Level Agreements with users, connectivity and business cycles. By doing this, timings may be calculated which will ensure that the server relocation will create minimal disruption to the clients users. Digital Photographs may be taken of all server racks prior to the move, to assist in the final re-racking process. For more complicated server racks that wiring schematics should be produced to assist in the re-assembly at the new location. 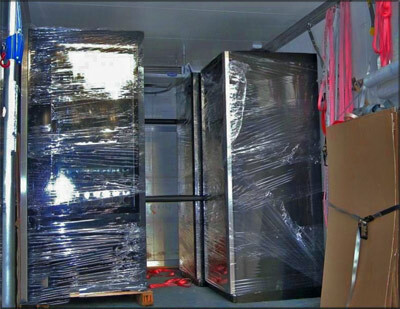 The server rack moving company should not not power down any server until they have a signed off agreement from the client that the necessary back-ups have been taken and are secure. Typically, Server equipment will be the last to be powered off, and the first to be powered on. The configuration details and connectivity will be accurately labelled and noted on the server moving sheet that will accompany the equipment during relocation. This means that when the equipment arrives at the new position the engineer can quickly check that all the components are present. Should racks need to be dismantled, and then all individual cards, shelves, and sliders will be labelled prior to the relocation. As servers are business critical, extra care is required in the packing and transportation. Therefore items will be handled using antistatic precautions where appropriate. 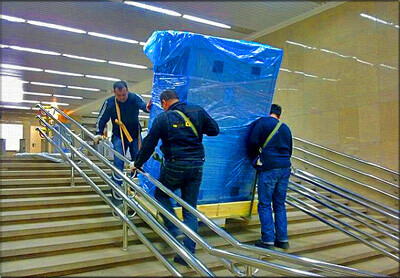 Larger equipment will be packed by server movers into antistatic bubble wrap and transferred to foam lined cages. Items such as flat screen monitors and large monitors are offered extra protection by packing the voids with additional foam. The benefit of using cages for larger types of equipment are that handling is smoother than in the moving crates and, because the items are clearly in view, the need for the equipment to be handled with more care is psychologically highlighted. Smaller items will be transported in crates as appropriate. The cages will be loaded onto air ride vehicles for transfer to the new site. Inside the vehicle, server racks will be fastened to dedicated fixing points against the sides of the vehicle, and all rack corners protected. Server related bespoke pedestals, benches etc. will be included in the server relocation. Equipment will be placed as per the agreed equipment room and rack layout at the new location. The full equipment schedule and the technology control sheet accompanying each item will be used as a reference to ensure that all the equipment is present at the new position. Our professional cable management process will ensure that cables are laid in following dedicated cable routes such that equipment is accessible and serviceable. The equipment will then be reassembled as per its required configuration and location and connections replaced to the common equipment such as switch, mouse, keyboard and Monitor. In liaison with the client's representative, the servers will be powered up, and all components checked for power up functionality. When testing is complete the control sheet will be signed off and the server handed over to the client's representative for final checks. As customers and their systems grow, server racks inevitably become untidy and disorganised. The rack relocation should be seen as an opportunity to enhance the current configuration and build in some growth. 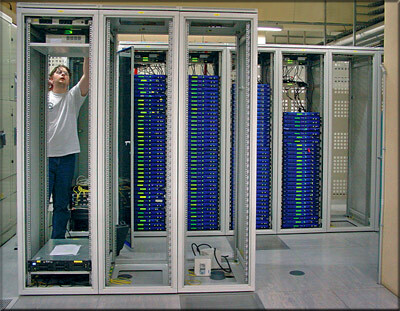 With this situation in mind our server relocation companies can provide a Rack Design and Configuration Service. Our IT experts will discuss and develop ideas for preferred rack layouts and future growth opportunities. They will offer a variety of options, from simply mirror imaging your current configuration, should that be the most appropriate, to complete rack rearrangements, all of which will be completed during the relocation programme. For further peace of mind office removals can recommend, discuss and agree contingency plans and disaster recovery requirements. If required our server move team can carry out data backups prior to the relocation. The risk analysis for the smooth transfer should be carried out by the server mover together with the client to develop Contingency and Disaster recovery plans. A spares holding may also be set up at the client's request. Third line support may be organised with the system manufacturer if considered appropriate and agreed with the client.